Hello SkatterBenchers, today we will show you how to overclock the ASUS ROG GX700 in a minimum amount of steps and time. 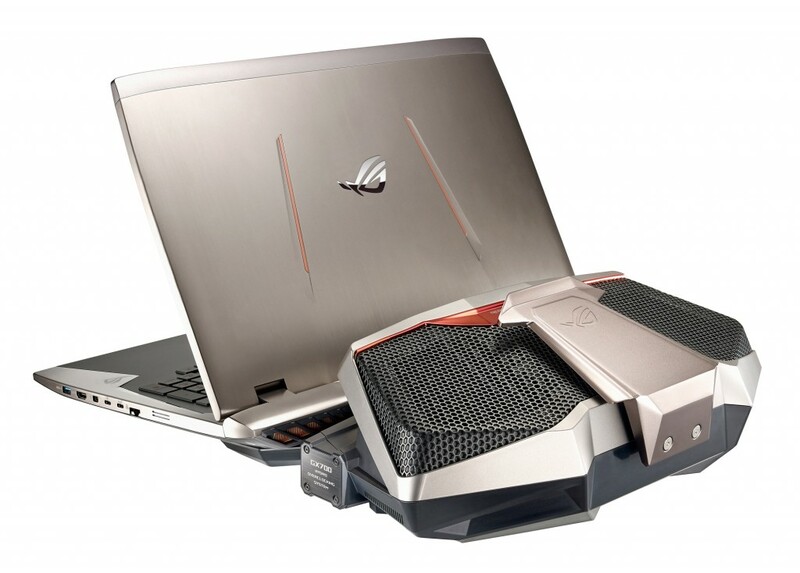 This is the ASUS ROG GX700 V0 notebook which comes with watercooling as well as a Core i7 6820HK processor, a desktop grade GTX 980 graphics card and 64GB of memory. To do the overclocking we will be using the ROG Gaming Center application and in there we will switch up the Turbo Gear settings. We will be using four different benchmarks in the operating system to measure the performance; Intel XTU, ROG Realbench, F1 2014 and 3DMark Fire Strike Extreme. Note: Today will be a little bit different than our other SkatterBencher videos because we can’t really change that much manually. At stock without the notebook attached to water cooling the CPU runs at 2.7GHz and boosts up to 3.6GHz. The graphics card is clocked at 1,189MHz with the memory clocked at 2.5GHz. The stock performance in XTU is 1079 points. In Fire Strike Extreme it’s 4,790. 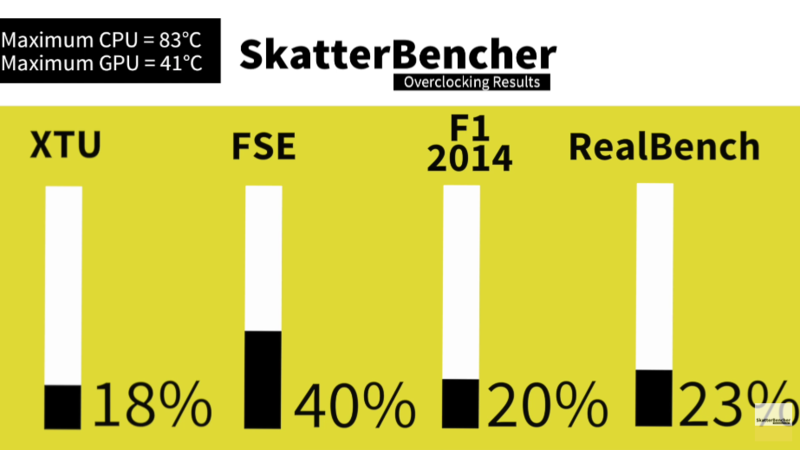 In F1 2014 the minimum FPS is 59 and the Realbench score is 84,094. The temperature of the CPU was about 82C and the temperature of the GPU was about 60C. Now we’ll move forward and plug the notebook on to the water cooling system. Now that we’ve docked the notebook on to the water cooling system we go into the ROG Gaming Center and check the Turbo Gear settings. We noticed that the settings went from standard, to extreme. We noted that the CPU frequency increased to 4GHz and the GPU frequency increased to 1,227MHz and the GPU memory frequency to 3.5GHz. Once again we checked the benchmark results and in XTU our score goes up to 1,148 points, which is an increase of about 6%. In Fire Strike Extreme our score goes up to 5,683 points which is an increase of 20%. 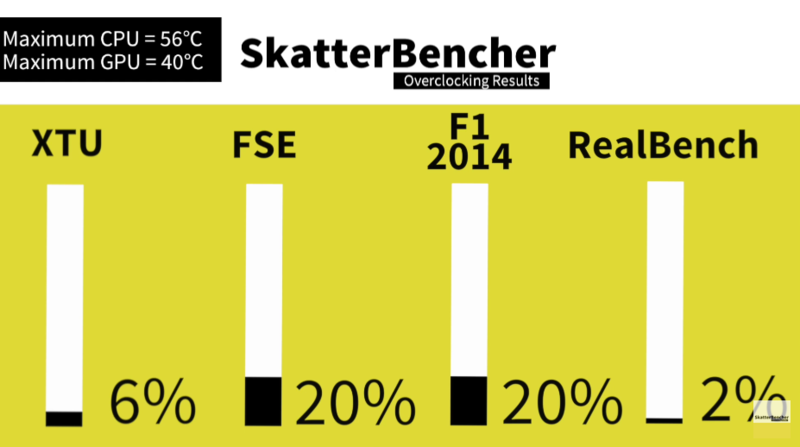 In F1 2014 our minimum frames per second is now 70 FPS, which again is a percentage increase of 20%. In Realbench the percentage goes up a mere 2%. Thanks to the water cooling our CPU temperature decreased to 56C and the GPU temperature decreased to 40C. As a final step of our overclocking adventure, we will switch to manual mode. We increased the CPU frequency to 4.0 GHz, we increased the CPU cache frequency to 4GHz. We enabled XMP and then we also increased the GPU core frequency by 200MHz as well as the GPU memory frequency by 300MHz as well. 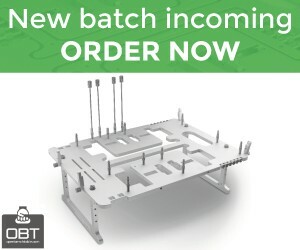 In a final round of benchmarking we find that the XTU performance has gone up to 1,271 points which is 18% over stock performance. In Fire Strike Extreme we see that our performance went up to 6,665 points which almost 40% over stock performance – this is thanks to the 1,427MHz GPU frequency and 3.8GHz memory frequency. In F1 2014 our minimum FPS has gone up to 71, which is 20% over stock performance and in ROG Realbench we now have a score 103,741 points, 23% over stock. The CPU temperature under load is 83C and the GPU temperature under load is only 41C. That’s all for today’s article. If you want to learn more about overclocking check out the other videos at the SkatterBencher YouTube channel. Don’t forget to subscribe and also ask any question you want below the video and we will try to answer it. If you have any questions related to overclocking the notebook, check out Massman’s ROG GX700 thread on our forum – you’ll find a handy reset guide as well as a couple of benchmark score indicators. We will be back soon with more overclocking content. Until the next time. Thanks for joining us. Earlier this month I had the opportunity to get familiar with the ROG GX700 notebook. There are a couple of things that got me interested in this massive device. First of all, of course the water cooling. It's a huge device you can hook the notebook up to. Secondly, the hardware. It features not only the first mobile -K processor, the Core i7 6820HK, but also a desktop grade GeForce GTX 980 GPU and 64GB of DDR4 memory. A beast of a notebook, in other words. 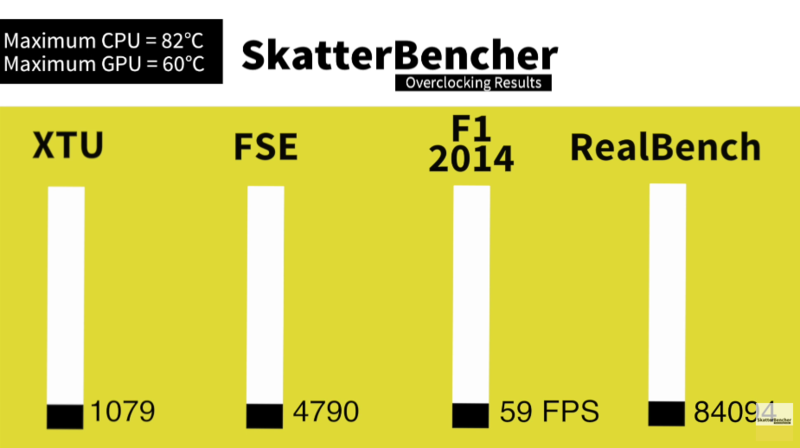 Soon we will have a SkatterBencher video up showing you how to overclock. In this thread I just want to share a couple of results and findings for those who are interested. The overclocking part is quite straight-forward. You can use the ROG Gaming Center to switch between Standard, Turbo, Extreme and Manual mode for CPU overclocking. Extreme and manual are only available when you have the notebook hooked up to the water cooling. The CPU runs by default at 2.7GHz and turbos up to 36x ratio (or 3.6 GHz). The turbo rate is unlocked up to 41x as configured by the notebook's BIOS. I've seen other notebooks support 46x ratio, so it seems to be a design choice. Inside the software application you can increase the BCLK from 100 MHz to 105 and 110 MHz if you wish to do so. Bear in mind that only at 100MHz BCLK you can enable XMP. At 105 or 110 MHz, the XMP option will be grayed out. As for GPU overclocking, there is a bit more headroom. For both the GPU and the memory you can go up +300 in the Gaming Center application, which is also the limit in Nvidia Inspector. By default the GPU is running at 1189/2505 under load. When you hook up the water cooling, the turbo frequency automatically increases to 1227/3500 MHz. Through manual overclocking I was able to increase it even further to 1427/3800, maxing out the memory but still with some headroom on the GPU. 1.4GHz turbo boost with a notebook is pretty darn impressive in my books. To measure performance I used XTU because that's where most of the 6820HK action is. For my final score I achieved 1444 points at 4160 MHz which is currently the top result in the hardware category. Yeey, golden cup! The trick is to enable XMP and increase the BCLK beyond 110 MHz to have extra memory frequency. I see some folks with better CPU frequency, so there's no doubt this score will soon drop in the rankings. But as I said ... disaster almost struck after this session. I tried increasing the memory frequency further and it was unstable. After reboot, the settings stuck in the BIOS. Because the BIOS didn't reset (even with the long-press on the power button) I was forced to open up the notebook and remove two of the memory sticks to force a BIOS error. If you are using any other software tool than the ROG Gaming Center to overclock the GX700 notebook, chances are you will be looking at this section, pulling your hair, to find out how to un-brick your notebook. There are two ways of forcing the BIOS to reset. 1) force a BIOS error by for example removing memory and 2) clearing the BIOS by removing the battery. Both approaches will require you to open up the notebook. Together with Blu3 we played with the same laptop for a moment last weekend on IEM, made a quick 1276 XTU at 4000, but there were lots of other people at Asus stand so we couldn't go to great lengths pushing it. We were impressed by its performance, but I think it's not really affordable, even if we split the cost. interesting thread man I had sample of GX700 for few hours and it was able OC it in BIOS.